properties are very imperfectly realized, but we can argue from this fact that the medium which we are considering might have the various properties which it must possess in an enormously exaggerated degree. It is, at any rate, not at all inconceivable that such a medium should at the same time possess both properties. We know that the air itself does not possess such properties, and that no matter which we know possesses them in sufficient degree to account for the propagation of light. 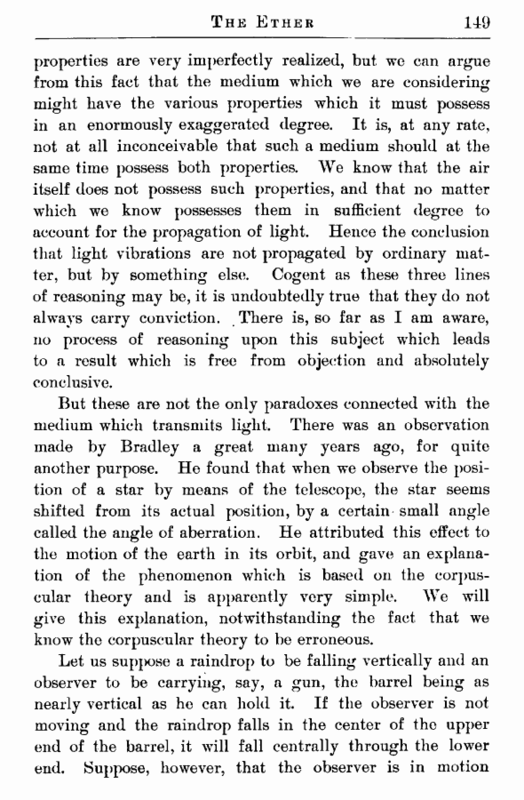 Hence the conclusion that light vibrations are not propagated by ordinary matter, but by something else. Cogent as these three lines of reasoning may be, it is undoubtedly true that they do not always carry conviction. There is, so far as I am aware, 110 process of reasoning upon this subject which leads to a result which is free from objection and absolutely conclusive. But these are not the only paradoxes connected with the medium which transmits light. There was an observation made by Bradley a great many years ago, for quite another purpose. 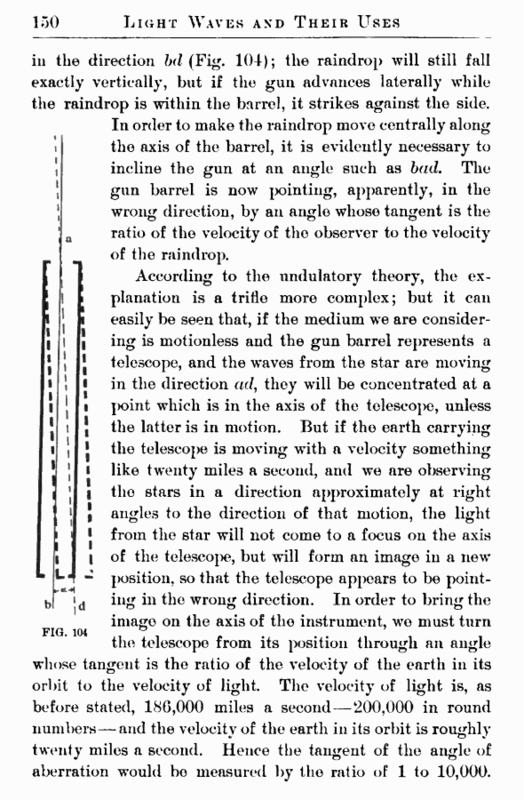 He found that when we observe the position of a star by means of the telescope, the star seems shifted from its actual position, by a certain small angle called the angle of aberration. He attributed this effect to the motion of the earth in its orbit, and gave an explanation of the phenomenon which is based on the corpuscular theory and is apparently very simple. We will give this explanation, notwithstanding the fact that we know the corpuscular theory to be erroneous.